Since 1989, Dr. Stacy Aslan has been successfully treating patients through the philosophy that the body has its own innate ability to heal itself—as long as that ability is allowed to flow from the brain to the tissue, glands, organs and muscles without interference. In essence, Dr. Aslan sees his role as an enabler of the body’s own natural healing properties as opposed to one who manipulates them. 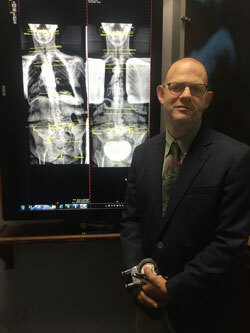 Using a comprehensive approach that incorporates state-of-the-art technology, traditional Gonstead methods, nutritional guidance and a keen ability to listen to and empathize with his patients, he’s been able to build a practice all on his own where many of his patients will drive over an hour each way just to visit. Perhaps the most important “method” he employs is a rare combination of realism, perspective, and compassion. He’ll always provide an honest evaluation of his ability to help each patient. Usually, he can. A recognized authority on chiropractic and healthy living, Dr. Aslan has lectured at the New York Chiropractic Council, Huntington Senior Center, Huntington Public library, many fitness centers and corporations, and has been featured on well-known Neurologist and talk show host Dr. Beatrice Engstrand’s radio show. This approach allows Dr. Aslan to have an impressive success rate in treating a diverse group of patients and cases ranging from common spinal disk problems to post-operative spinal surgery recovery to neurological illnesses—even to correcting breach pregnancies—and beyond in patients of all ages.